Our place is filled with framed pictures of loved ones and special moments that keep memories alive. So when I was offered the chance to design my own picture frame at 1stframes.com, I jumped at the chance. 1stframes.com is a small business in Temperance, Michigan. Its owner, Dean Vollmar started the company several years ago when he realized he wanted to stay home with his (then) preschool age daughters. I can't begin to tell you how much I love that. 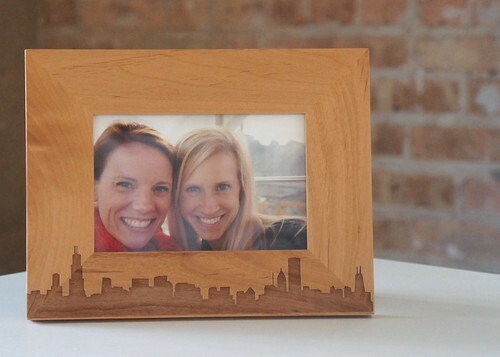 The frames are made from alder wood and personalized using a laser. They are the original "You Create" picture frames. There are tons of pre-designed templates you can choose from or you can send 1stframes a quote or a picture of your own to be added . Vollmar claims anything you can create, can be put on a frame. I decided to put his claim to the test. I included a rough picture of the Chicago skyline in my online order expecting to be asked for a better image or clarification. Imagine my surprise when my frame showed up at my home a few days later - no clarification needed. But what's even more important, it looks cool. Ordering the frame through the 1stFrame website was quick and simple. And I couldn't be happier with the finished product. everything on the 1stFrame website is 25% off! What would you put on YOUR 1stFrame? *I was given this frame to review c/o 1stframe.com but was not compensated for this post. The opinion shared is my own.